You’ve read the numbers. You know that more than half of your audience members are receiving your emails, visiting your webpages and engaging with your social media channels via their mobile devices, not their laptops. Make mine to go Learn to get the word out on the mobile web via blog posts, emails and webpages in this digital-writing workshop. Problem is … reading on a smartphone is as different from reading on the web as reading on the web is different from reading print. Reading your webpage on a mobile device is like reading War and Peace through a keyhole. It’s not easy to get the word out on a 3×6-inch screen. 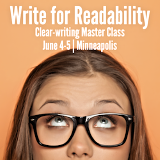 But in this three-in-one digital-writing workshop, you’ll learn best practices for overcoming the obstacles to reading on the screen when writing blog posts, emails or webpages. One day: Choose one channel: 1) blog writing, 2) email writing or 3) web writing. Two days: Choose two channels. Or make it a Master Class and cover one channel with extra time for practice, perfection. Three days: Cover all three channels in a Master Class with extra time for practice, perfection. Three days: You’ll learn all three channels in this Master Class with extra time for practice, perfection. One hour or half day: Bring a keynote, breakout session or half-day workshop to your association chapter or conference. Choose an overview of either 1) Mobile writing; 2) Blog writing or 3) Email writing. Email recipients open just 32% of their emails. And unless they open your email, there’s not much chance that they’re reading your email. So how do you reach readers in their inboxes? Go beyond the subject line. Before sending an email, make the most of the four key elements recipients consider before deciding whether to open your message — or to delete it without reading further. Craft the most overlooked element on your “envelope.” 24% of recipients check this before opening. Too often, senders forget to write it — or, worse, have never even heard of it. Avoid 3 common subject-line approaches that reduce opens. That trick you’re using to draw them in? It may be keeping them out. Write mobile subject lines. Chances are, yours is twice as long as the recommended benchmark. But where’s the fold? Content that shows up above the fold on a 30-inch monitor can take as many as five screens on a smartphone. Pass the 1-2-3-4 test to put your message where web visitors’ eyes are. Tip: Try this simple test on your smartphone for best results. Make the most of the best-read element on your page. Most communicators drop it altogether. Steal headline-writing tips from the BBC — the source of the best news heads on the web. — Cean Burgeson, senior content creator, Whirlpool Corp.
It’s the secret of successful blogs, e-zines and content marketing pieces: Talking about yourself and your stuff works about as well on a blog post as it does at a cocktail party. But watch your online reach and influence grow when you start writing relevant, valuable, useful digital content. Find the right story — and craft the best story angle — for blog posts, content marketing pieces and social media status updates. Position your company as the expert in the field and draw readers in with good ideas they can use to live their lives better. Get more likes and shares with stories that better serve your audience. Tap the power of the most-retweeted word in the English language. And avoid the one topic nobody wants to read about. Did you know that there’s a writing structure that that’s been proven in the lab to attract 300% more readers and 520% more reading, increase social media shares and boost understanding, engagement, interest, satisfaction and more? Fill in the blanks to the best tipsheet, survey story and case study you’ve ever written, using our easy templates and writing prompts. Avoid three leads that reduce online reading — including one that’s been proven in eyetracking studies to make people skip your first paragraph. Tap three secrets of successful subheads. This “may be the most important thing you do” to improve usability of your webpage, according to research by the Nielsen Norman Group. Did you know: It’s 48% harder to understand messages on a smartphone than on a laptop? People read 20% to 30% slower online? Attention spans on mobile devices are 50% shorter than on laptops? In this environment, how do you avoid overwhelming mobile readers? Hit the right targets: What’s the most effective length of a blog post? A short story for your e-zine? A webpage? An online paragraph? A sentence? A word? Pass The 1-2-3-4-5 Rule for paragraphs that are easy to read on the small screen. Increase usability by 58% with one simple step. Make long webpages easier to read on a smartphone with three quick tips. Even highly educated web visitors read, on average, just 20% of words on the page, according to a Nielsen Norman Group analysis of 50,000 page views of European computer scientists, psychologists, sociologists, engineers. The stats are even worse for blog posts and emails. Bust the myth of page view time. Help readers understand better, remember longer and enjoy your piece more — in half the time. Tear down obstacles to reading your page, post or email by passing the Palm Test. Write better listicles with our 6-step list-writing makeover. Avoid getting your head cut off. What’s the right length for online headlines that don’t get cut off by email apps, social networks — or humans? Book Ann for an in-house or association workshop. Register for Reach Readers Online, Ann’s three-day online writing workshop in Portland, Oregon, on July 24-26.